I personally agonized over my choices of Japanese Water Stones years ago, it was fun deciding, there is no denying that but at the end of the day, 10 years later, I could have made smarter choices. I also was on the fence for years about hand made Japanese knives, I once thought that they seemed to be more trouble than they were worth, this was before I actually used one. Let's talk about knives first. This is not about what we NEED, nobody needs a dream knife like this, we don't need cars and microwaves and iPhones either, this is about items that can enhance our lives, we love having nice things, it's only natural. The question is, is this knife going to enhance your life or is it just another knife with a fancy name and incredible handle? Let there be no doubt in your mind, this knife will enhance your life, it will absolutely blow your cooking mind. 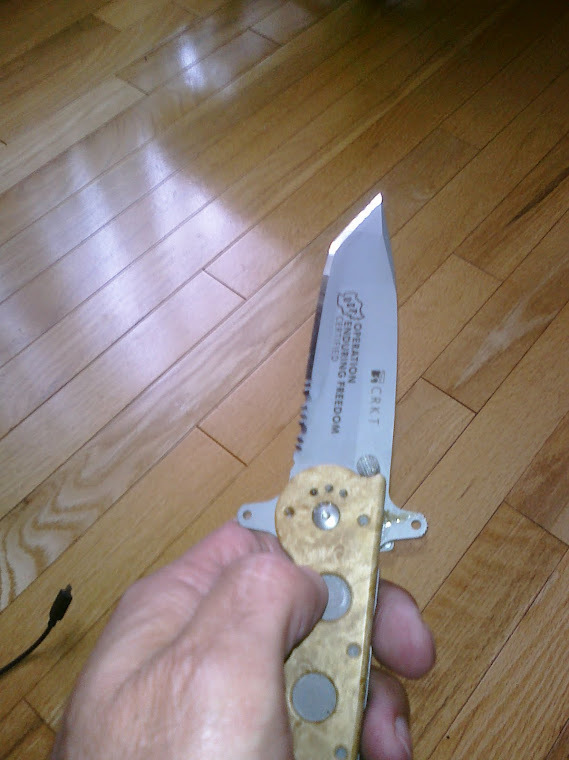 As I mentioned, I was on the fence about this type of knife but after using one and seeing it in my hand and feeling the edge, all negative thoughts vanished. The steel is what does it, I can sharpen this knife at 11 or 12 degrees per side and it will stay sharp much longer than our average Henckels or Wusthof. Also, the edge, the level of sharpness is quite startling, so when you use something like this for the first time to slice a tomato you will definitely be thrilled. 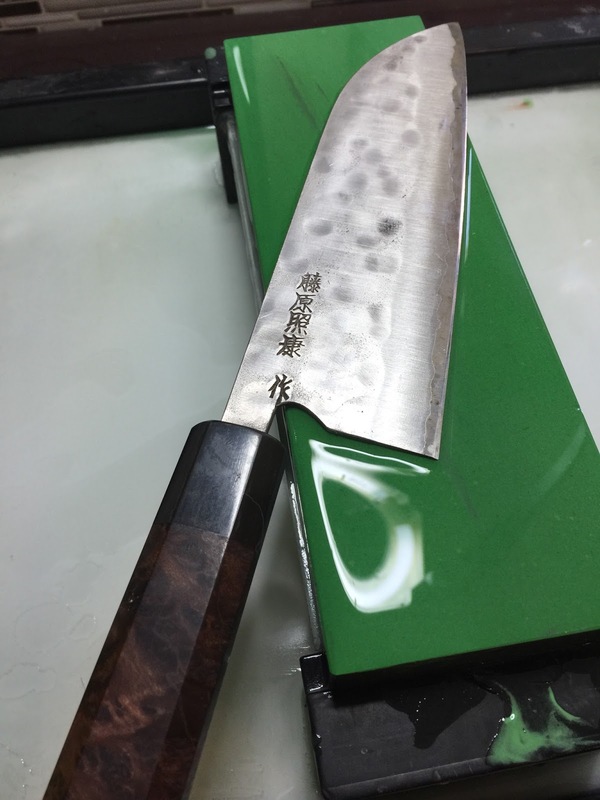 Now you don't need a 400 dollar Fujiwara with a custom handle to experience this, you can get a fantastic edge from a Tojiro as well. The point is that these knives will make a difference, how do you choose one? I know that I am forgetting some but these are brands I have seen, felt, used and sharpened. So any of these, and of course there are so many others out there, I just haven't had one in my hands yet. 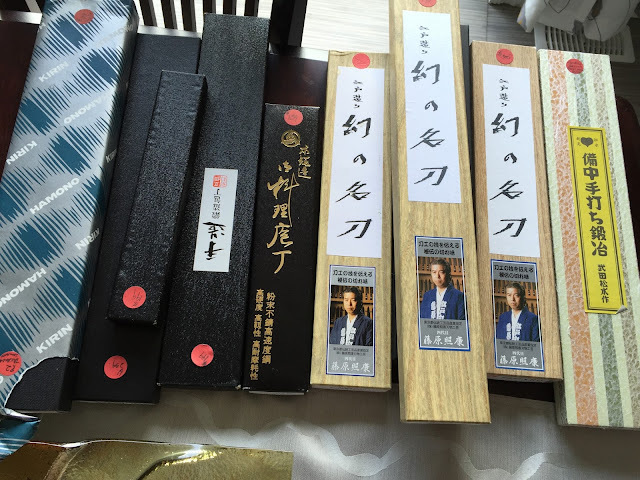 You can trust these knives, the steel, usually, Shirogami (White), Aogami (Blue), R2 Powdered Steel and other incredible steels that are used by Mr. Carter and Mr. Kramer is what makes them so special of course. If you are on the fence, you could just get one of them and the prices are not as high as I used to think. I can get a nice Takamura for under $200.00. What makes them better than an average Henckels? Assuming that both knives are sharp to begin with, I had to use my Fujiwara to appreciate the difference in slicing food. Of course, the fact that they are hand made, often with beautiful handles makes them special, but that aside, it is their ability to slice effortlessly and maintain an incredible edge for a longer period of time that in my opinion makes owning at least one, worth the price and again, the price is not always that bad. I have a Takeda here with a custom handle made from 300 year old birch that is $549.00 CDN, so in my opinion, that is not a bad price for a knife of that calibre. 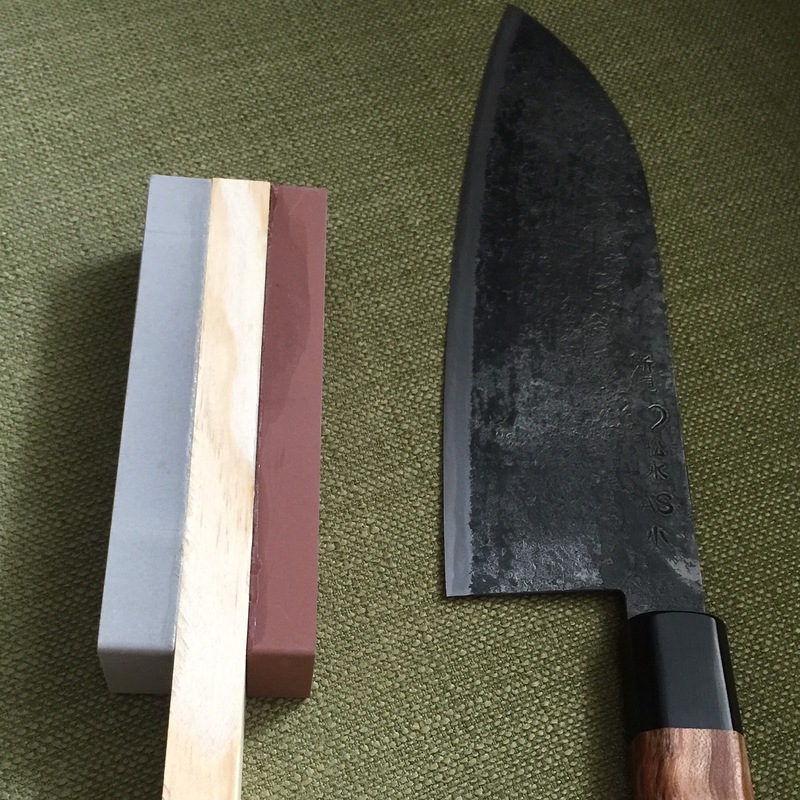 As a sharpener, there is an added bonus: They are easy to sharpen, I can very quickly get my Fujiwara back to the beyond razor sharp edge that it came with, that speaks volumes towards the skill involved in it's creation. There are other non-Japanese knives out there of course that are not hand made that are great, the Miyabi's, the Henckels Twin Cermax for example, beautiful knives but more expensive that many hand made Masakage and Takamura. It goes without saying that these knives are only special when they are sharp, so you need to have a sharpening plan if you are going to own one. That may seem very obvious but you would not believe how many of these knives that I see being used that are well beyond being dull. In these cases, they are no better than a sharp $40.00 knife, seriously and it really bothers me when I see this. Now as for the steel in a knife, all the information you need on steel is out there and easy to find, enjoy the learning process, if you have an interest in a knife, it is your responsibility to find out what White Steel means. 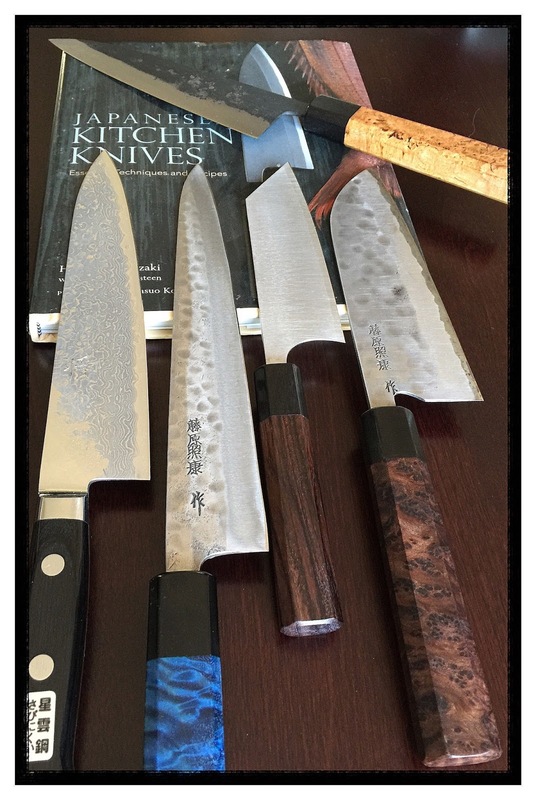 Now as for the choice of a particular blade style, you can't go wrong with a chef knife, or Santoku style of blade. Of course it has to feel comfortable in your hand and be of the correct weight. The Takeda's tend to be very light, despite their size and some folks don't like that. In terms of quality, you won't be disappointed but of course you should should choose a knife that feels right in your hand. If all you slice up is vegetables, then a Nakiri may be best for you. Now what about a knife as a wedding gift. I gave my Niece a set of Tojiro knives for her wedding present. I can honestly say that in 10 years from now, it will likely be the only wedding gift that she received still used on a daily basis, they make fantastic gifts. If you are considering one, just do some light research to make you feel better about your choice and remember to purchase it with the knowledge that it will become dull, sooner than you hope. Why do I say that? I have a theory about it, when I got my Fujiwara it was accompanied by five ordinary knives, the ones that 95% of people own and use daily. (Nothing wrong with them) So one would think that the Fujiwara would stay sharp 3 times longer than the Wusthof, that is what one would think. 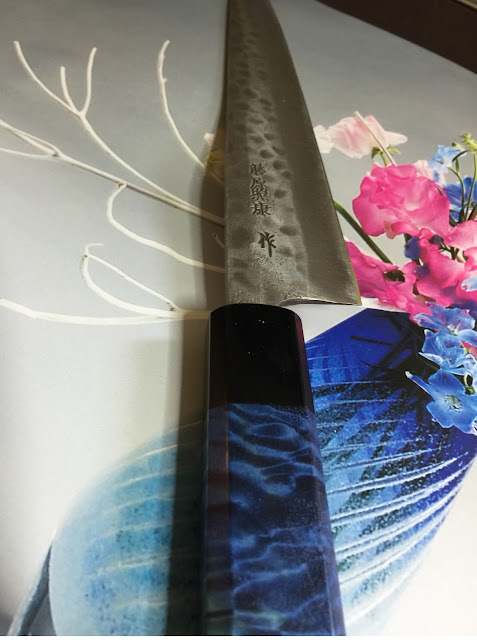 However, what happens is that the Fujiwara soon becomes the workhorse, it bears all the pressure and force associate with slicing since it was the only knife being used. It isn't hard to understand, if it is used more, and it will be used more, it will get dull faster. Takeda with hand held Takeda Whetstone. That is it for knives, if you have a means of keeping the knife sharp then don't hesitate to purchase one if it is in your means, if not, if you can't keep it sharp, don't bother, it will only be a source of frustration. In the US I would use Chefknivestogo.com. This is where I started off on the wrong track but that is because I didn't do my homework. I'm only talking the last 10 years, remember, back in the 70's there was no Google, there was no computers. 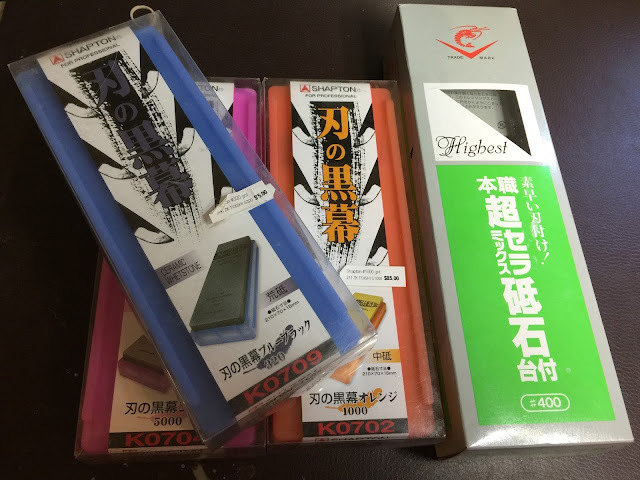 The only whetstone you should not buy is one of those $7.00 ones from the hardware store, those are garbage. So if you get water stones or oil stones that is fine, I am not here to tell you that water stones are better than oil stones, the purpose of this article is to help anyone who needs help in selecting water stones. This is easy. In a previous post I talked about the water stones I like. For grit choices I highly recommend a coarse stone, anything from 320 to 800 and you can follow that up with a 1,000-2,000 grit stone, with the 1k stone being the most logical and best choice. That's all you really need unless you are sharpening Japanese steel, the Dream knives mentioned above. In those cases a 3 stone combination is very very nice. I often use a 400, 1k, 5k combination or even a 400, 1k, 5k, 8k Combo on my Fujiwara. You should concentrate on getting to the point where you can get your knives sharp on the coarse stone, I mean very very sharp and then go to the 1k stone. That's it, thanks for reading my article. Thanks for sharing! I am obviously not as a skilled sharpener as you are, and don't own expensive knives and stones either, but the article is clear enough. Some opinions, as you very well describe, are biased because of the interest on selling something. That's fine, it is something you would expect BTW. But others are even more difficult to tell apart. Those from people who got knives (or stones, or cars, or anything else) and spent a lot of money. Your brain biases your feeling, believe it or not! There was an article about photographic lens testing, telling you to take a picture, write down lens setting (focal length and aperture), change settings, write down again... and so on. Then you had to hide the paper and check the pictures, because if you watched the pictures with the paper at hand, your brain was going to "tell" you which picture must look better. 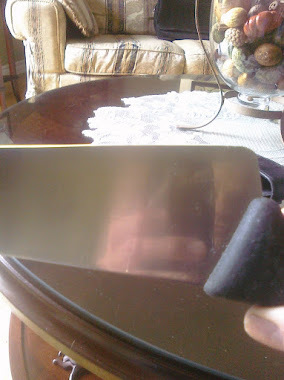 OTOH: Where I live, most of the kitchen knives are like this one http://www.gastronomiabashir.com.ar/media/catalog/product/cache/1/image/5e06319eda06f020e43594a9c230972d/c/u/cuchillos-foto-40.jpg They have a straight edge for, say, 2/3 of the lenth, and then a steep curve, and they usually have a straight top of the blade. That is a cool piece about the lens, that makes sense. FYI I only own one good knife, I don't need any more than that. I'm focused mostly on water stones and sharpening. You don't need expensive stones in my opinion. I appreciate you visiting my Blog :). Take care. 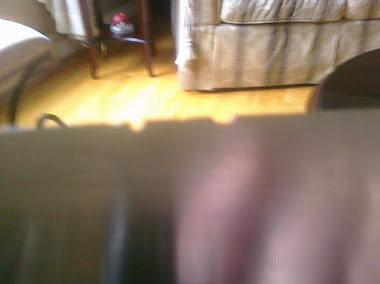 I just opened the picture of the knife, I get a lot of those style of blades. If you want to know something weird: I live in a spanish-speaking country (Argentina); well, kind of spanish. If US guys call "english" what they speak, we can call "spanish" our slang ;-) In spanish nouns have "gender", so things must be either male or female. "Knife" ("cuchillo") is male but that special kind of blade, when pointed upwards, seem to be a pregnant lady, so we use the female form "cuchilla" for them. I don't know whether this happens somewhere else besides Argentina. That is interesting and yes I am sure it happens in other languages, thanks for sharing. Argentina, that is one place I have not been, I have travelled the world, maybe someday.